Apply online application to SBI Clerk Recruitment 2018 8301 Junior Associates Clerk in Support and Sales. State Bank of India (SBI) Recruitment Board, latest notification for Junior Associates Clerk in Support and Sales. Applicants can get full advertisement below and submit the SBI online application at www.sbi.co.in. Applicants who are going to apply, ensure SBI jobs that you are eligible for post of Junior Associates Clerk in Support and Sales. The applicants will have to apply online, no other option. The last date of submitting online application is 10.02.2018. SBI notification further information such as eligibility criteria, syllabus and how to apply etc. listed below. Education qualification: Bachelor Degree in Any Stream in Any Recognized University in India. Knowledge of Local Language. Payment of application fee can made through Online Fee Mode Debit Card, Credit Card, Net Banking, Mobile Wallet, Cash Card, UPI, or Pay the SBI Clerk Examination Fee through Offline E Challan Mode, Submit to Any Branches of State Bank of India. Recruitment 2018 Admit card candidates have to login with their registration number and birth date as password and then can download the Admit card. The time and the venue of the examination is listed on the admit card only. The SBI Clerk Prelim result will be out in June 2018. Those who will be passed will only be eligible for the main paper. The SBI Clerk Recruitment 2018 Clerk Result will be published Support and Sales. State Bank of India (SBI) Recruitment Board, latest notification for Junior Associates Clerk in Support and Sales in the official website of SBI. Candidates have to login with their registration number and password (birth date) to know the exam result. SBI Clerk Recruitment 2018 Cut-Off off marks depend on the number of vacancies that particular state has. At times students get confused about diverse cut offs in different stats. Official website of the bank. Candidates are required to download the reason is that depending upon the vacancy cut offs are decided. However each candidate has to secure the passing marks to be selected for the next step. 2. Click on the Registration page. The final steps make payment using any online net banking service. Applicants must keep the following documents and details ready before they begin filing up the online application form of SBI Clerk. Applicants have great chance to get jobs SBI Clerk Recruitment 2018 Recruitment, however if someone want to ask anything please comment below. Apply online SBI application to SBI Recruitment 2018 50 Deputy Manager. 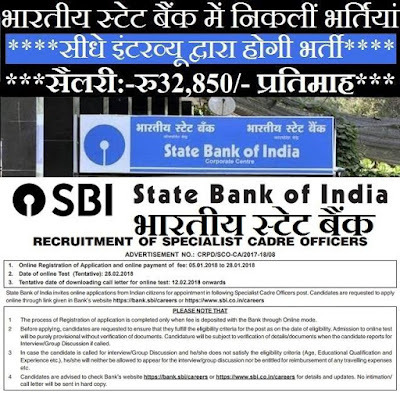 State Bank of India (SBI) Recruitment Board, latest notification for Deputy Manager. Applicants can get full advertisement below and submit the SBI online application at www.sbi.co.in. Applicants who are going to apply, ensure SBI notification that you are eligible for post of Deputy Manager. The applicants will have to apply online, no other option. The last date of submitting online application is 28.01.2018. SBI jobs notification further information such as eligibility criteria, syllabus and how to apply etc. listed below. Minimum 2 years’ experience in statutory/internal/ Concurrent Audit of Banks, in/with a Chartered Accountant firm engaged in statutory/internal/ Concurrent Audit of Banks or in employment of a Bank. Any other work that may be entrusted by the Bank. Category: SC- Scheduled Caste, ST- Scheduled Tribe, OBC- Other Backward Classes, PWD- Persons with Disability, OH- Orthopedically Handicapped, VI- Visually Impaired, HI- Hearing Impaired. Selection: Online Test and Interview/Group Discussion. centers. CANDIDATE SHOULD CHOOSE THE NAME OF THE CENTRE WHERE HE/SHE DESIRES TO APPEAR IN THE EXAMINATION. NO CHANGE IN THE CHOICE OF EXAMINATION CENTRE WILL BE ENTERTAINED. THE BANK, HOWEVER, RESERVES THE RIGHT TO ADD OR DELETE ANY CENTRE AND ALLOT THE CANDIDATE TO ANY CENTRE OTHER THAN THE ONE HE/SHE HAS OPTED FOR. Age Limit: candidate’s minimum age limit 21 Years to upper age limit 35 Years As On 30.06.2017. Pay Scale- Rs.31705/ - Rs.45950/-. Payment of application fee can made through Non-refundable. 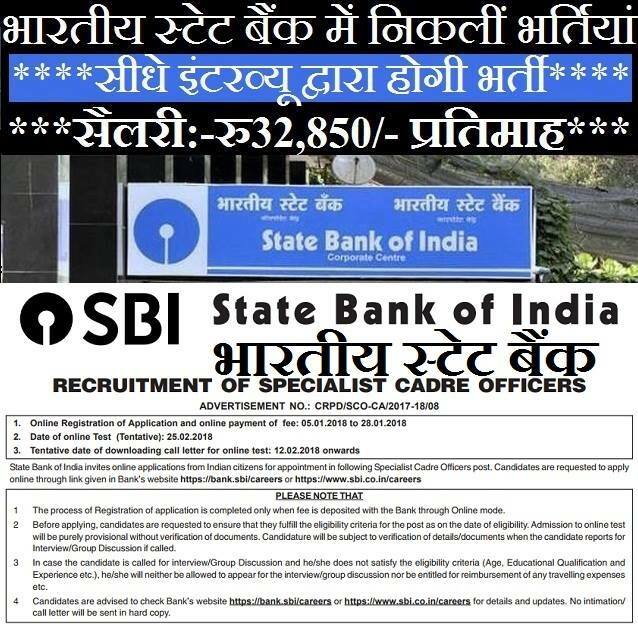 How to apply: Eligible applicant require to apply online through SBI Recruitment 2018 website www.sbi.co.in from 28.01.2018. 1. Log on to the State Bank of India (SBI) website www.sbi.co.in. 6. Make the payment by Non-refundable. Applicants have great chance to get jobs State Bank of India (SBI) Recruitment, however if someone want to ask anything please comment below.